The wait is finally over! The leader in affordable and easy-to-use complete chess software Chess King 4 is now available as a download for the Mac! 12th Women’s World Chess Champion and Chess Queen™ Alexandra Kosteniuk comments her win against International Master Andreas Huss from the Swiss Chess Championship in Silvaplana 2003. Join our Master Chess Class, sit back and watch this commented chess video and learn how World Chess Champions think! 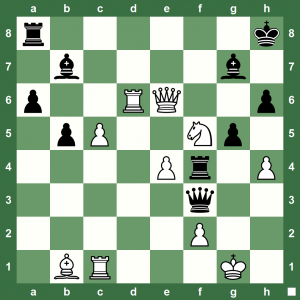 Escaping-Checkmate Chess Puzzle: How did White Turn the Tables? Death is on the line via g2, but White finds a way to escape and win! 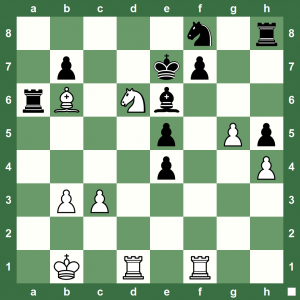 What was the dramatic win for White in this game Lima – Quinn, Yerevan Chess Olympiad, 1996? Special Price.Normal DVD Price $25, Normal Combo Price $59. IN STOCK. 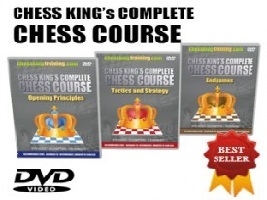 Chess King’s Complete Chess Course 3 DVD Set is the quickest and easiest way to learn the chess basics, the patterns, tips, strategies, techniques which will turn you from a beginner into an accomplished chess player. The DVD video format makes it simple to improve your chess. Just watch, listen and learn. This Course is a fountain of knowledge for parents and coaches. The set contains close to 5 hours of structured instruction with over 100 ready-to-use examples of sound chess fundamentals. Recommended for players Unrated to 1500 Elo. Ideal for Junior and improving players to reach club player level. Useful for parents and coaches to gather material for their chess lessons. The high quality DVDs feature 12th Women’s World Chess Champion and Chess Queen™ Alexandra Kosteniuk and a portion of the proceeds go to support her Chess Fund. There are those magic chess moves that win a game immediately, but are very difficult to spot. Do you practice tactics and checkmating puzzles every day? The world’s top Grandmasters have millions of chess patterns programmed into their mind thanks to regular practice. That’s how you get a keen ‘chess vision’. Let’s check yours this evening. What’s the magic move Black used to win the game immediately? 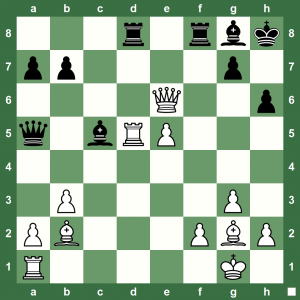 Missiles-in-Control Chess Puzzle: How does White Win? How good are you at controlling the diagonals on the chess board? Let’s take a look at this position from the game Burzlaff – Stark, Oschatz, 1958. White has huge center control, but the Queen is under attack. 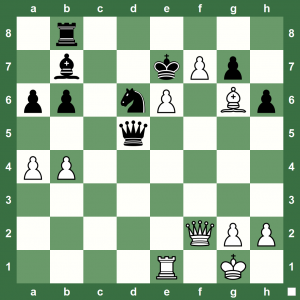 White is also troubled about the Rook on d5. 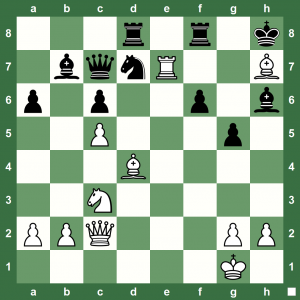 So, what would you do if you were playing White? 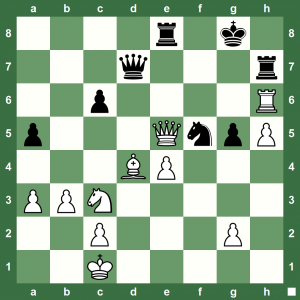 Quite Easy Chess Tactics: How did White Win? 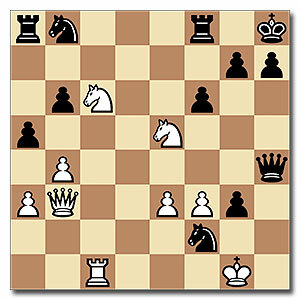 White has built a huge attack on the Kingside in this game Brynell – Dysing, Stockholm, 1999. 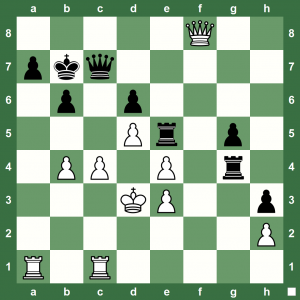 Do you think White has a forced checkmate, or will it take longer to win in the endgame? Save $33 on World’s DGT Top-of-the-Line Chess Clock! Buy at the Chesskingtraining.com Shop. Extra upcount timing method makes it ideal for other board games. 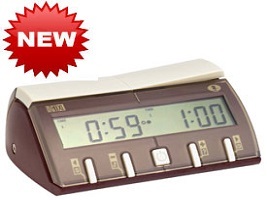 The DGT XL Digital Clock sets a new standard in Digital ExcelleVFRe. It is the ultimate clock, one that is user-friendly, attractive and offers all of the features that chess enthusiasts demand. It is designed to interface with the DGT electronic chessboard and your computer. It is the official clock of the World Chess Federation (FIDE). White is dead if Black gets just one chane. How do you think White played this in the game Rosin vs Jurgens, Hamburg, 1980? 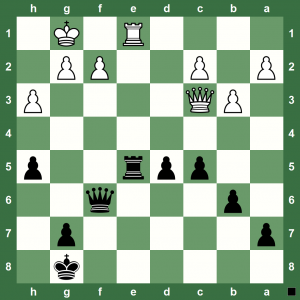 In this chess position from the game Moor – Girardin, Neuchatel, 1996, Black has done everything to stop from White checkmating the Black King. Still, White found a nice way to win. Do you know how? 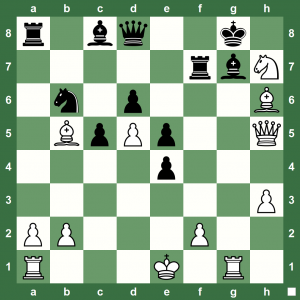 Material Chess: What’s White’s Winning Combination? The winning combination for White is just too obvious in this chess position from the game Pankratov – Biktachiev, Tashkent, 1983. Can you see it? The position is blocked in this chess game Kasparov – Lefstein, Baltimore, 1997. 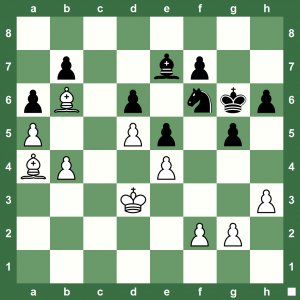 What did White do to end the blockade and free his rolling pawns to promotion? 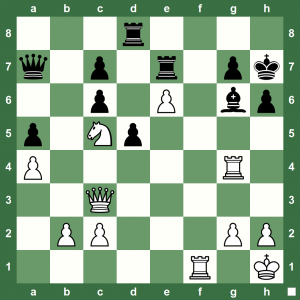 Winning Chess Combination: What are White’s Winning Lines? 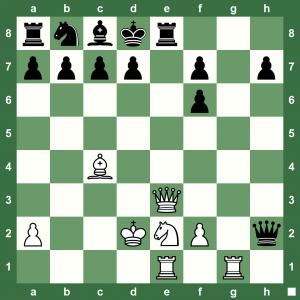 Evaluating how many pieces you have attacking the King and how isolated is the King under attack from his own defenders is the key to building a solid winning chess combination. This position is from the game Weeramantry – Trabert, Hawaii, 1977. White to play. Let’s see how alert you are tonight with this chess position from the game Hever – Siklaj, Hungary, 1975. White to play for a forced checkmate! This is a delightful winning combination from the chess game Goldin – Horvath, Budapest, 1996. White finds a quick way to demolish the Black defenses with a checkmate in three! What is it? How strong is your chess calculation? Can you calculate all the winning lines to checkmate here in this position from the chess game Perlasco – Grasi, Como, 1907? 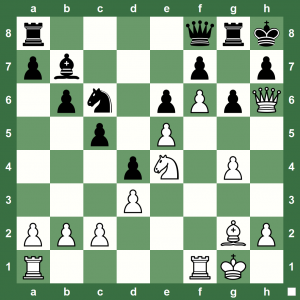 How good are you at your chess patterns? The world’s best Grandmasters have thousands of chess patterns programmed into their brains! 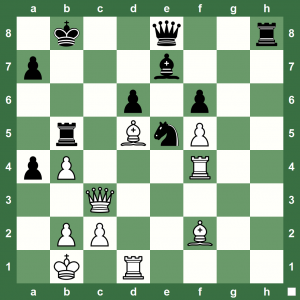 Check out this position from the game Moran – Pupo, Matanzas, 1995. White to play one magic move for a winning position.